Nearly 20,000 runners followed in the footsteps of fallen New York City firefighter Stephen Siller on September 26, 2010 in the Tunnel to Towers Run. The race, now it its ninth year, draws participants from all over the country and around the world. Many firefighters, police officers and military members run in full gear to emulate Siller’s determination. It is an emotional event for all who attend. Freedom Alliance hosted Scholarship Fund recipient Kalie Walters to three nights in New York City culminating with the 2010 Tunnel to Towers Run. Kalie, 20, is the eldest daughter of Technical Sergeant Howard Walters, USAF, who was killed in a MH-53 helicopter crash in Afghanistan in November 2003. He was assigned to the 20th Special Operations Squadron, Hurlburt Field, Florida. After the run, Kalie was escorted on stage by Kilgannon and presented by the Stephen Siller Foundation with the “Freedom Alliance” award in recognition of her family’s sacrifice. 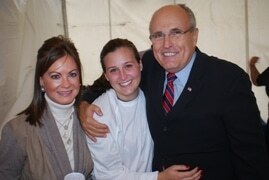 Kalie also met former NYC Mayor Rudy Giuliani and his wife and Freedom Alliance 2004 Defender of Freedom award recipient US Navy Seal Steven Toboz. When the ceremonies had concluded, all of the race participants were treated to a free concert by country music singers Montgomery Gentry.